Canon has unveiled a range of new cameras including several compacts to be shown off at CES this week. Among the usual PowerShot and A series snappers there is something a little different; The Canon PowerShot N. It’s easy to spot because of its shape – it’s almost square. This squat little camera uses a new “Creative Shot” mode which “intuitively analyzes an image and automatically creates a series of five artistic photos of the original with varying composition, lighting and color for an array of options that are ready to impress”. Then, what does every creative want to do with their pictures? Yes, the camera makes it easy to share the artistic compositions using its “enhanced wireless capabilities”. The shape and built-in automatic creative filters aren’t the only unusual things about the configuration of the PowerShot N. In a bold move Canon has changed the physical interface of the camera and located the shutter and zoom controls on the lens extrusion. “The outer ring controls the shutter, which can be released from any point on the ring, and the inner ring controls the zoom, so managing the PowerShot N is easy and effortless,” optimistically explains the Canon press release. You can also take pictures by prodding the touch-screen. 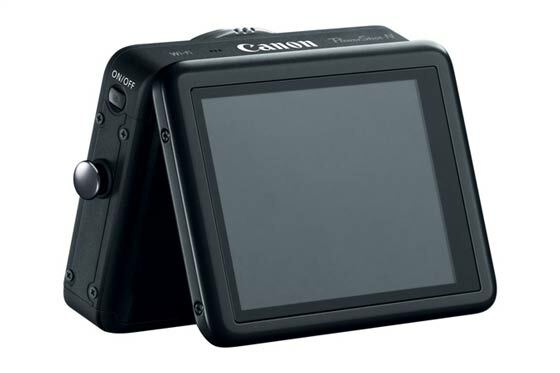 The touch screen on the camera back can tilt by 90 degrees, Canon says that this “encourages users to capture images from a wide array of angles and positions effectively in virtually any location” though there have been cameras before this one with much more flexible pivoting screens. When you have taken your pictures and they look the way you want, the camera can copy images to your iOS or Android device using the free Canon CameraWindow app. In addition to your phone the Mobile Device Connect button can send photos/videos directly to Facebook, Twitter, YouTube or via email. 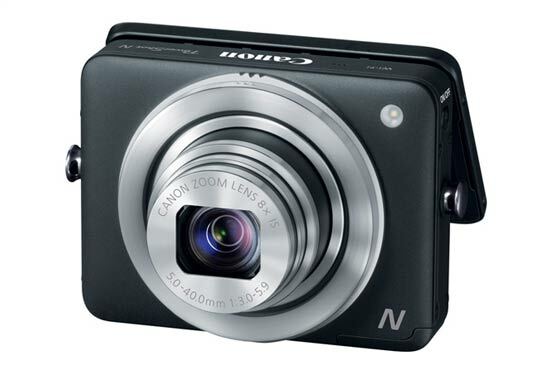 The PowerShot N is an interesting new camera from Canon; but will this innovation by rewarded by popularity? I must be getting old because I find the flood of new digicams with these “connected” features pretty annoying. Quite like the idea of smarter cameras that can do in-camera processing, but I really can't see the point of the ones that make upload to Facebook etc a number one feature - unless you're talking about cheapie “handbag” point-n-shoot fodder of course.